After writing my graduation post, I seem to have had brain fade. Completely skipped a week. Before I get completely screwed up, I’ll go back to week 23. 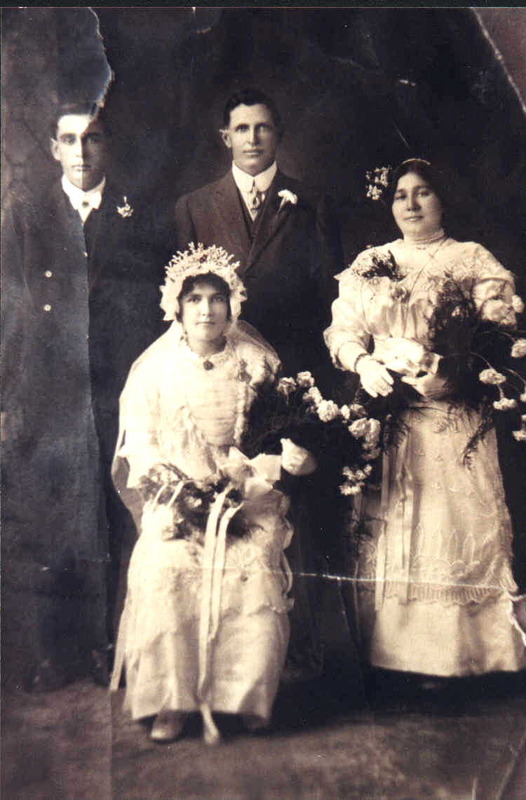 I don’t know much about the weddings of my ancestors and only have a few photos of brides in my ancestral line. So, today, I’ll write about what cousin, Eva (Ventura) Nunes, wrote me year ago. It never occurred to me until her letter just how wedding receptions were handled. Today, we cater our affairs. Other people cook and serve. We sit back and enjoy. But, in the early 1900s, the Portuguese immigrants who left Hawaii for California handled weddings themselves. These were close-knit communities and didn’t venture much beyond their neighborhood. While the second generation spoke English, the first to Hawaii spoke Portuguese almost exclusively. Perhaps there weren’t even many caterers in the area. Because of all of these or none of it, Eva told me that it was up to the mother of the bride to arrange the food for the wedding. This meant that most of Portuguese mothers never saw their daughters get married. They could not attend church because they were too busy cooking meals and overseeing the arrangements for the party that would follow. There was no popping anything in the microwave. Everything had to be cooked from scratched starting a couple of days before the affair. I am sure that they had plenty of help. Most likely many of the women, family members and friends, either brought dishes or were on hand to cook and bake. Can you imagine the amount of work that would entail? I think of my grandfather’s side of the family. He had 45 first cousins who were alive when he married. Most had spouses and children. Because family was important and they recognized distant cousins, the guest list could be quite long. And, you know, they would never say no to family. I think of my own great grandmother, Maria (de Braga) Pacheco Smith, seen in this photograph. She was a widow when her only daughter, Maria, married Anton Souza on the 4th of July in 1914. I wonder if she had the money to buy what was necessary. Who helped her get the feast ready? This is her daughter’s wedding photograph. From this I know that family was on hand because the older couple in this photograph are Maria’s brother, Jose de Braga, and his wife, Maria Jacinto da Camara. It makes me a little sad knowing that all these mother’s missed out on seeing their daughter’s weddings. The Portuguese were very religious. I am sure they would have wanted to be in church shedding tears on such a special day. Next time you go to a wedding reception and see all the plates being served think about your ancestors who may have had to prepare the food themselves. They did this out of love and tradition, as well as economic reasons. Wedding traditions vary around the world. I wonder how many of my ancestors missed their daughter’s weddings, just like Maria (de Braga) Pacheco Smith?